I snapped this the other night when we went to vote. My wife asked me to as she was unable to go at that time. 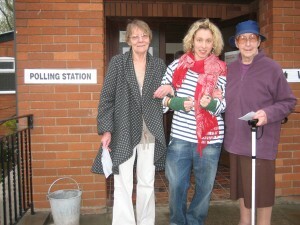 From left to right, mother-in-law, daughter (first time voter) and Miss Joan Williams (age 94). So this photo possibly includes the youngest and eldest voters in the village. I’ve only decided to post it here now because my wife sent it to the Hereford Times and they are going to publish it this Thursday. Surprisingly they are not primarily interested in the youngest/oldest angle but rather the Grandmother/Granddaughter take. No disrespect Beryl! This entry was posted in Husband, Father, Dog Walker, The Rest by RedEyedMonster. Bookmark the permalink.